VIDEO: Raptors vs. Cavaliers Game 2 Full Highlights - 2016 NBA Eastern Conference Finals - Balita Boss! 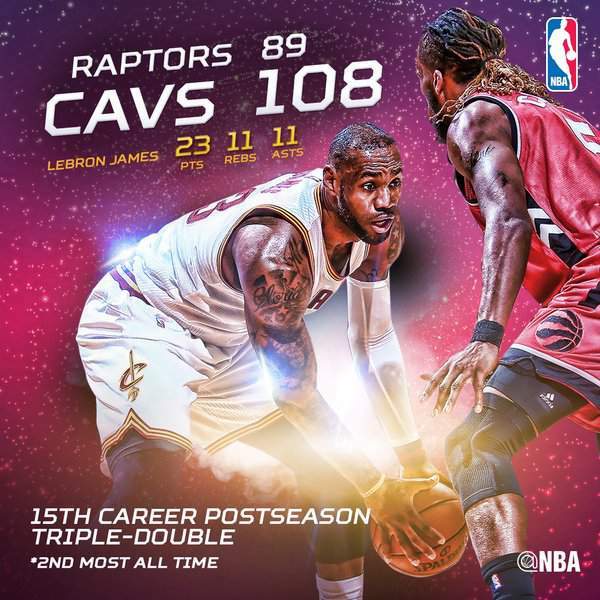 LeBron James with 23 points, 11 rebounds and 11 assists, picked up the 15th triple double of his playoff career, and led Cleveland Cavaliers for a 108-89 win in Game 2 of the 2016 NBA Eastern Conference Finals against Toronto Raptors. Kyrie Irving scored a game-high 26 points on 12-for-22 shooting with four rebounds and three assists, while Kevin Love added 19 points. The Cavaliers remain undefeated in the 2016 playoffs, joining the 1989 and 2001 Los Angeles Lakers and the 2012 San Antonio Spurs as just the fourth team ever to win its first 10 postseason games. Kyle Lowry continued to struggle, finishing with 10 points on just 4-for-14 shooting from the floor while DeRozan led Toronto with 22 points. Game 3 is Saturday in Toronto (Sunday in Philippines).